On April 2, 2019, Microsoft, and the BMW Group announced a new community initiative to enable faster, more cost-effective innovation in the manufacturing sector. In manufacturing today, production and profitability can be hindered by complex, proprietary systems that create data silos and slow productivity. The Open Manufacturing Platform (OMP) is designed to break down these barriers through the creation of an open technology framework and cross-industry community. It is expected to support the development of smart factory solutions that will be shared by OMP participants across the automotive and broader manufacturing sectors. The goal is to significantly accelerate future Industrial IoT developments, shorten time to value and drive production efficiencies while addressing common industrial challenges. Built on the Microsoft Azure Industrial IoT cloud platform, the OMP is intended to provide community members with a reference architecture with open-sourced components based on open industry standards as well as an open data model. In addition to facilitating collaboration, this platform approach unlocks and standardizes data models that enable analytics and machine learning scenarios – data that has traditionally been managed in proprietary systems. Utilizing industrial use cases and sample code, community members and other partners will be able to develop their own services and solutions while maintaining control over their data. With currently over 3,000 machines, robots and autonomous transport systems connected with the BMW Group IoT Platform, which is built on Microsoft Azure’s cloud, IoT and AI capabilities, the BMW Group plans to contribute relevant initial use cases to the OMP community. One example is the company’s use of their IoT platform for the second generation of its autonomous transport systems in the BMW Group plant in Regensburg, one of 30 production and assembly sites worldwide. 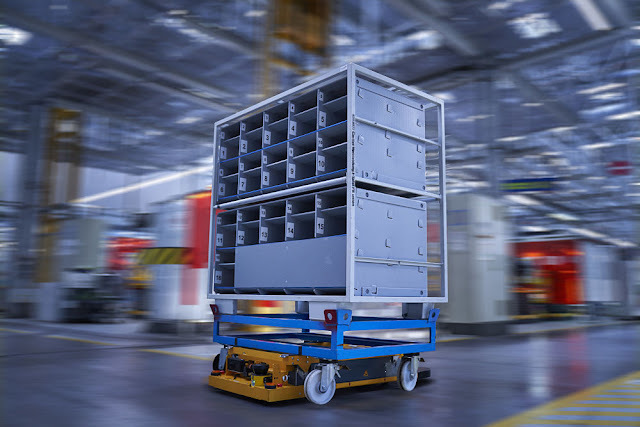 This has enabled the BMW Group to greatly simplify its logistics processes via central coordination of the transport system, creating greater logistics efficiency. In the future, this and other use cases, such as digital feedback loops, digital supply chain management, and predictive maintenance, will be made available, and in fact, developed further within the OMP community, with the BMW Group retaining ownership of its pre-existing business Intellectual Property (IP) and data. The OMP will be designed to address common industry challenges such as machine connectivity and on-premises systems integration. This will facilitate the reuse of software solutions among OEMs, suppliers and other partners, significantly reducing implementation costs. For example, a ROS-based robotics standard for autonomous transport systems for production and logistics will be contributed to the OMP for everyone to use. The OMP is compatible with the existing Industry 4.0 reference architecture, leveraging the industrial interoperability standard OPC UA. "This is very good news for the manufacturing industry," says Stefan Hoppe, President, and CEO of the OPC Foundation. "The use of open international industry standards such as OPC UA in the OMP community enables manufacturers, machine builders, and suppliers to integrate their existing equipment and systems efficiently and securely. For a long time, companies have promoted proprietary, closed ecosystems - the OMP commitment to open development will shape tomorrow's manufacturing". The underlying platform will continue to evolve over time, along with manufacturing requirements, to incorporate new innovations including areas of analytics, artificial intelligence, and digital feedback loops. The broader OMP community is being formed now, with the recruitment of additional partners underway. The OMP Advisory Board is expected to be in operation with an initial set of 4-6 partners in place and a minimum of 15 use cases rolled out into select production environments by the end of 2019. The two initial partners, Microsoft and the BMW Group, encourage other manufacturers and suppliers including companies from outside the automotive industry to join the community. NOTE: The two companies have not disclosed how much they intend to invest in the OMP project.